For the Edible Idaho Winter 2015 edition, I explore the world of charcuterie at one of Boise’s restaurants known for local cuisine. A special thanks to Guy Hand for the mouthwatering photo. A pile of charcuterie books rests in a room tucked deep in the basement of Red Feather Lounge and Bittercreek Ale House. This is where salumists Scott Krick and Derek Peterson spend their days tinkering and experimenting with new recipes. The pair also butchers around eight turkeys, 36 ducks and two full pigs a week, and that doesn’t include seafood. Upstairs, garlands of dry sausages decorate the converted wine cooler that hovers above the Bittercreek kitchen. Pepperoni, chorizo, capicola, summer sausage, bresaola—this is where the butchers turn into scientists and eventually artists. As these sausages hang for weeks to months in a cool environment, they lose up to 30% of their weight. This is what cured meat makers are waiting for—that dry, chewy texture and deeply concentrated flavor. Charcuterie is one of the ways that restaurants can creatively utilize a whole animal. This is beneficial not just from an economic standpoint, it’s also an important way to respect the food. Dale Krick Jr., the kitchen manager and third brother, adds that as a result of the relationships these two restaurants have built with local farmers and ranchers, they know how and where the animals have been raised, which contributes to the quality of the end product. The processes and time needed to make these cured meats vary. Duck ham, a ruby-hued signature on Bittercreek’s Von Brotzeitteller board, is bathed in a molasses mixture and then smoked. Turnaround time for the duck ham and the bacon featured on Red Feather’s brunch menu is three to four days, while the pancetta can take up to nine weeks. 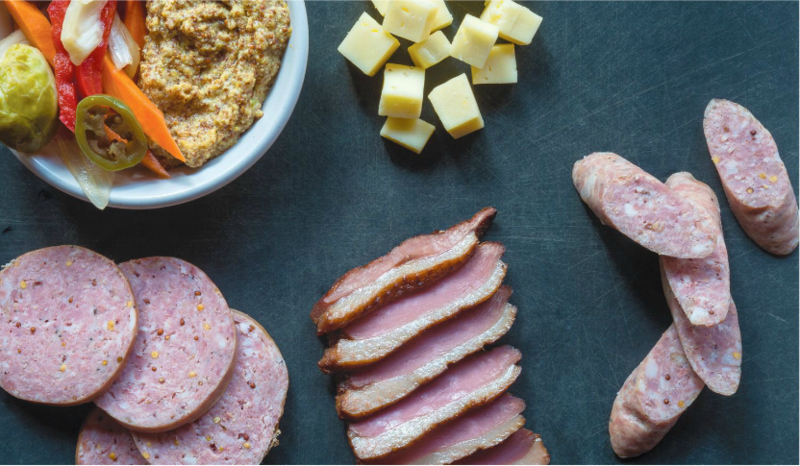 All this time and respect might not be the first thing that comes to mind when the charcuterie board arrives at the table—thin slivers of duck ham resting next to smoked Jagerwurst sausage and shavings of fatty Bresaola, or air dried beef. Accompanied by toppled white cheese cubes from Ballard Farms, housemade mustard and crisp, acidic pickled vegetables, the board is just too tantalizing not to get right to sampling.